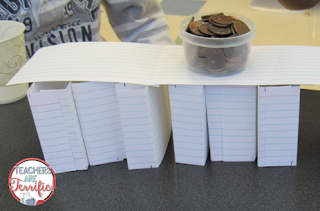 I have been promising a post about our Flood Barriers and finally got to it! So take a look at the video first. It is going to present a spectacular challenge to you, but then I am going to tell you the nitty-gritty! Okay, well here's the real scoop! 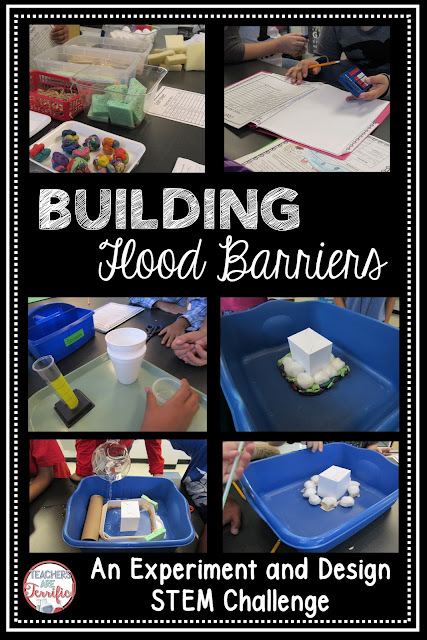 I had this amazing idea about having kids experiment with absorbent materials and then choose one to use in building a flood barrier. 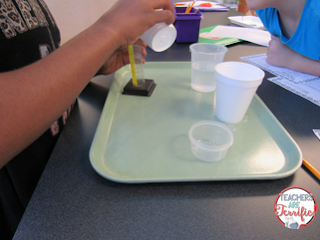 After determining how much water leakage there would be for each absorbent material the groups would decide what to use. Well, okay, this part worked pretty well. It was actually fun once I worked out the kinks! Then we moved on to the flood barrier part. Well, I had another brain pop and knew that if I just offered a bunch of materials to the groups they would just take some of everything! 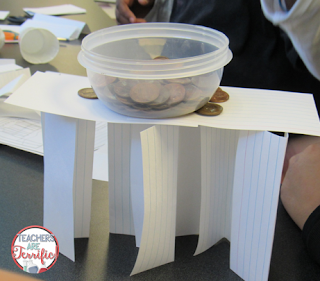 I learned a long time ago that the way around this is to have the kids work using a budget! So I set up a supply station and each item had a price. 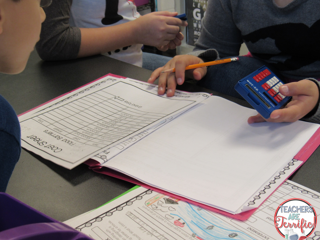 The kids had to fill out their cost sheet and then go shopping. One class told me they were shopping at STEM Mart! Ha! Okay, next it's time to build the barrier. Originally I told them stories about storm surge and flooding and we watched a couple of videos. The plan was to protect your house from flooding. Obviously, this was not exactly what I had in mind. 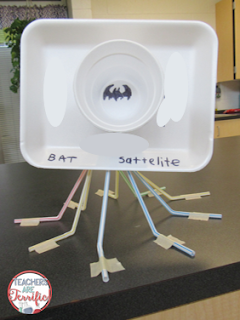 This was the Test Class and after they built things like this (and more) I knew I had to revise my thinking and explain it better. The next classes were told that the flooding was happening in their back yard and it was a doghouse. 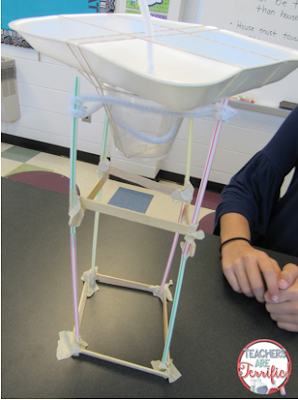 I also toughened the constraints to the task and added the rule that the absorbent material and other items could NOT touch the house or be taller than the house. Well, I know you can see that the tub above has water being added to it! That was what happened next. 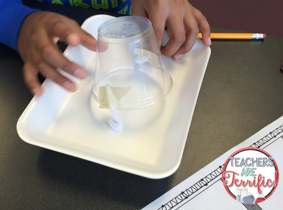 When the teams had their barrier ready we added two cups of water, waited 15 seconds, and then checked for leakage! It worked great. 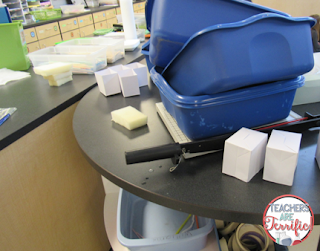 We removed the little house and there was zero leakage! As you might know, I try to tell you only the truth. And there are some things we learned in this challenge. I made mistakes in the materials. Yep. Let's look at those disasters! This was one built before I changed the rules. Looks like it might work, right? Nope. 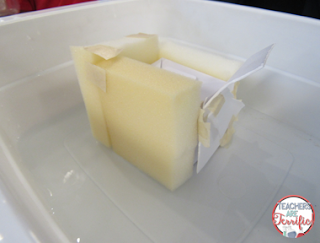 Those sponges are highly absorbent, but when you pack them around your house and they absorb water, guess what happens then? The water is transferred to the house! 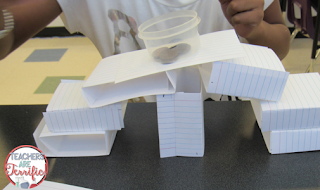 And I forgot to mention, these were paper houses. SAND. IS. NOT. A. GOOD. IDEA! I mean I thought it would be. Sand bags are used in floods, aren't they? 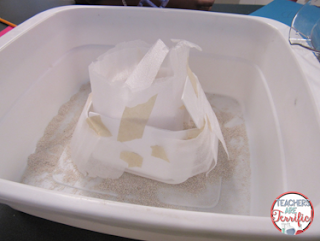 So, in the test class sand bags were one of the supplies. Only the kids didn't know that a sand bag is meant to be a BAG. They poured the sand into the bottom of the pans. 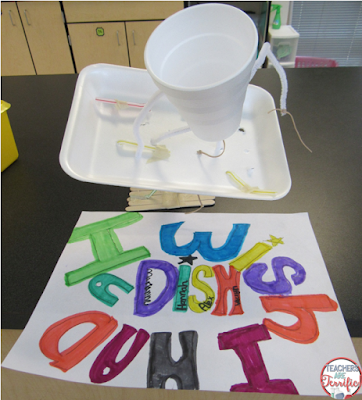 Did you know that sand will float? PLAY DOH. NOT A GOOD IDEA EITHER! I thought this would be better than sand. So with the next class I took away the sand and offered play-doh. Kids built these neat little fences. It stopped the water! Success, right? 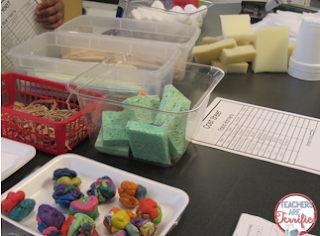 Do you know what happens to play-doh when it gets wet? Trust me, don't ever do it unless you want slimy gooey stuff that will not wipe up. I scraped it off the bottom of those pans. Lest you think it was all awful, take a look at the group of kids above. 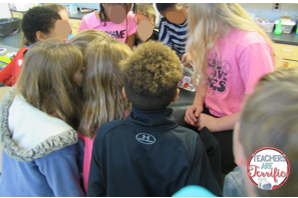 Every single time we tested a pan with water all the kids would gather around to watch. It was so much fun! If the house didn't leak, they would cheer and if it did they would groan. 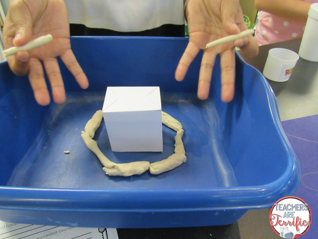 Even with the soggy play doh and wet sand. There's always so much to do at the beginning of the school year. 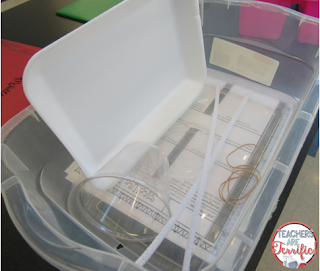 For me, this was really brought home when I started a new job with a science lab as my classroom. 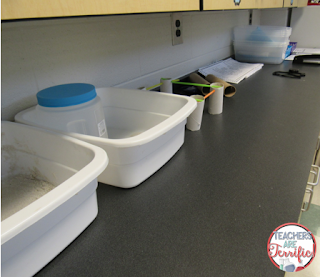 An empty, undecorated, bare-walled lab. 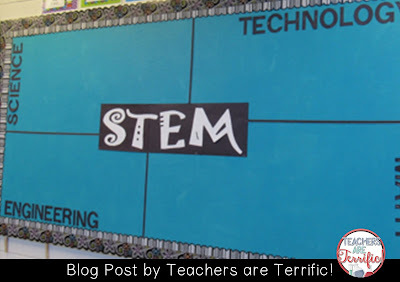 So, let me help you with some excellent ideas and tips for decorating your walls for science! 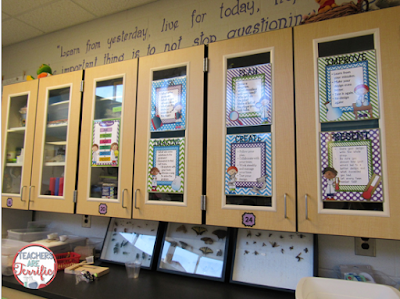 Of course, you might want to have a couple of really nice bulletin boards to display some science stuff. 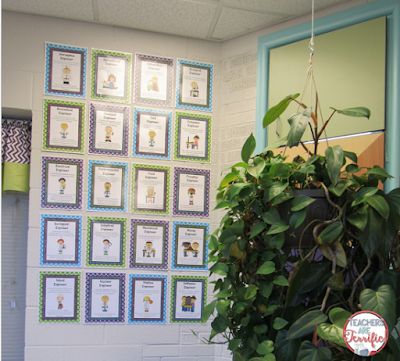 The story behind the bulletin board pictured above is on my blog already. Links are at the bottom of the post! This is actually my favorite board ever! But, what if your boards are covered with other stuff and you still need to show some science related things? Hmmmmm....here's some of the ways I do this! I discovered in the last few years that kids really don't know a lot about this at the elementary age, so I set out to make this part of their vocabulary and hope I am also teaching them a few things about variables and controls and making science-based hypotheses! I have a poster set that we refer to all the time! The set includes a title poster and a flow chart of the steps! It also includes a poster for each step written in kid-friendly language! 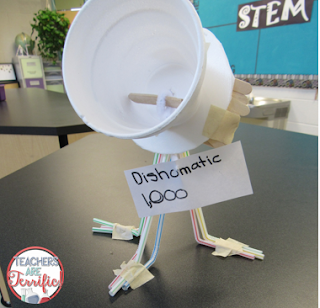 I have these taped to a column that juts out in my classroom. It's actually the downspout from the roof of the lab to the ground (covered with concrete blocks)! Anyway, I can stand right under those posters and have kids look at the step of the scientific method that we are discussing! We use these all the time! Okay, this is my second favorite bulletin board. I love that it is so simple. I had planned to add photos and drawings, but decided to leave it alone! The middle word was just one I projected from my computer in a silly font (Jokerman, perhaps) and then cut out the letters! Above the board are posters of Little Scientists. 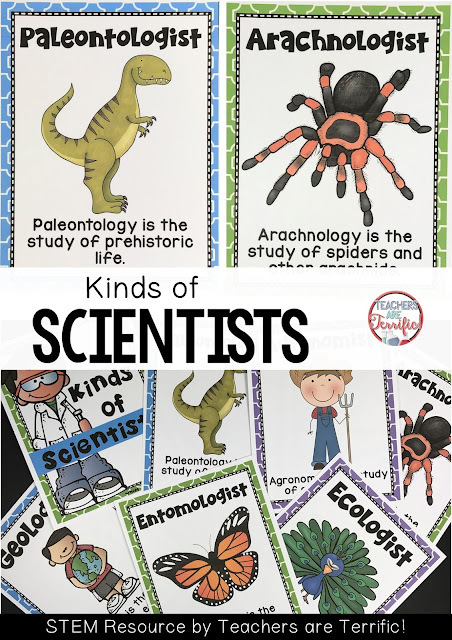 These are some I made a really long time ago in an effort to help kids see that scientists come in many varieties and they can be one, too! 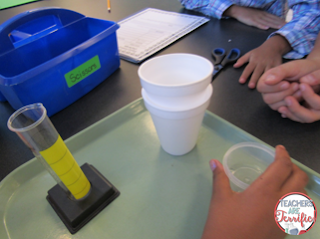 Science can be extremely specialized! Like, who knew there was a scientist that only studies reptiles? Here's a closer look at the posters! There are 20 kinds of scientists in this set! Running out of wall space! "Leave your personal belongings outside the lab!" Do you have girls at your school that wear a purse all day? Above the cabinets is a very decorative little area. You can see a large tree "cookie" and a dried starfish. There are also several conch shells. And a great quote I painted on the wall. 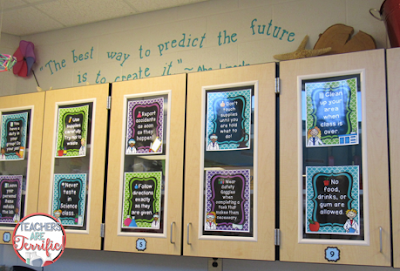 These cabinets are displaying posters of the Engineering Design Process. This was the very first poster set I made. 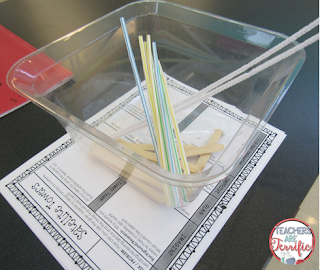 I needed this when I started as the STEM lab teacher and just could not find a set I liked anywhere. 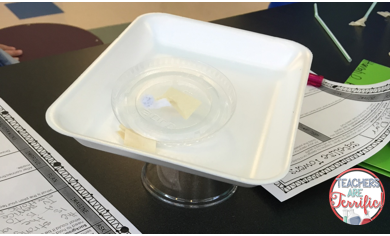 Most of the resources I found had all the steps of the process on one piece of paper. So, I made my own. Below the cabinets, you can see my insect collection and above the cabinets is another quote and some other cute things. I mean, why waste that space up there? 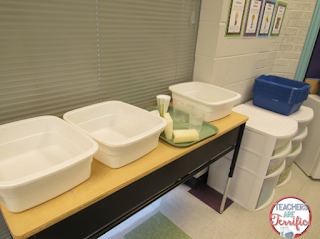 Storage bins would be great, but they look awful, so I use that space just to be pretty. Another set of posters! These are a set of Kinds of Engineers. Each poster shows a kind of engineer and the words tell about that person's job. 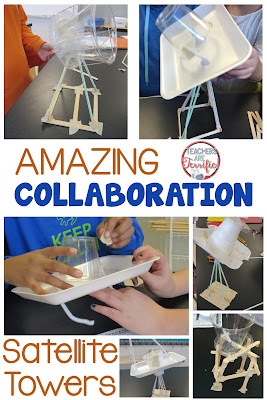 These are so fun to look at because kids get a sense of what jobs involve engineering and they come away knowing they can be one! Okay, here are the links to other bulletin board posts that show more about the two boards above. 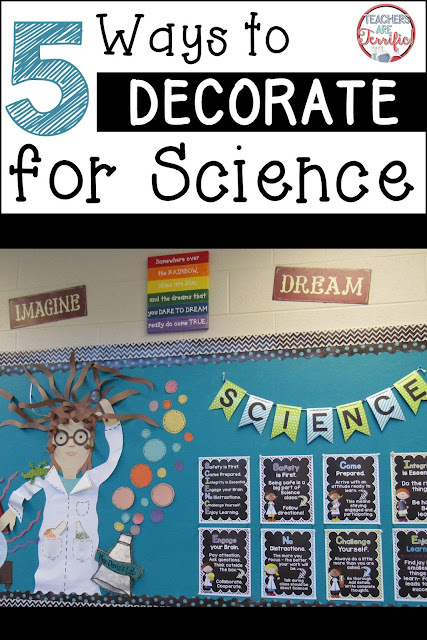 And there you have it- some easy ways to get science decorating into your classroom and, by the way, the posters are not just pretty. They are useful! The quotes and doodads on top of my cabinets - well those are just pretty! 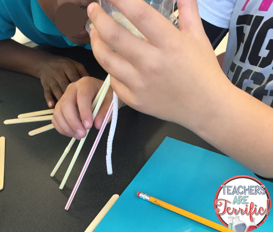 So, I was going back through blog posts the other day, looking for a photo and I kept finding the best little posts all about the STEM Lab. And y'all, the posts always look just so pretty! Anyway, I seem to always make my classroom look just perfectly spectacular and all good and you probably think it always looks like a magazine spread. I decided to devote this week's Lab Update to telling you the truth. 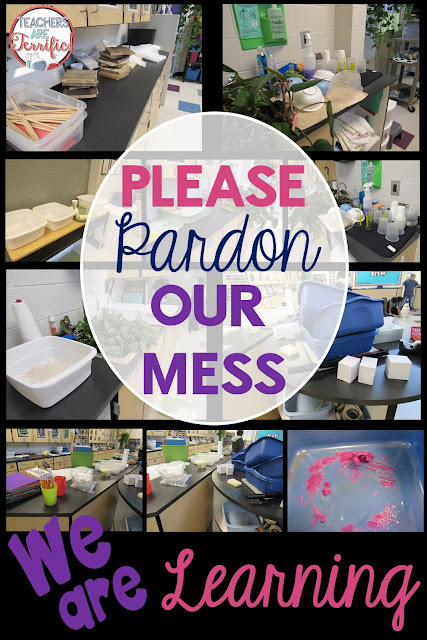 Sometimes our lab is a mess. A chaotic, sand-filled, playdoh covered, paper towels everywhere kind of mess. Let me just tell you all about one week that happened recently. Let's start right there with those innocent looking little tubs. 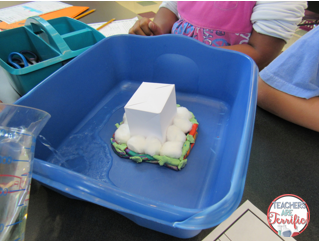 My fourth graders were experimenting with absorbent materials and the second part of the challenge was to design a flood barrier. So, I had this bright idea that sand would be a great supply. First of all, kids don't know how to clean up sand when they spill it. Wait a second, they actually do have a technique. It's called "Rake it off onto the floor!" Well, my idea was that sand BAGS would be the way to stop the flood so in the first (and only) class that tried sand I gave them little bags I had filled up. I was thinking SAND BAGS. Not what the kids had in mind. They dumped the sand into their containers to surround the house we were flooding. 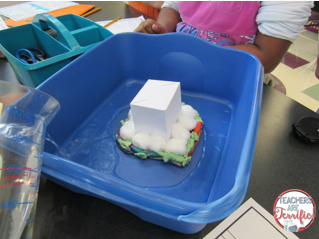 Did you know that small amounts of sand will float? Anyway, then I had all these containers of wet sand. So, let's move on to the second class. I put away the sand and got out the PLAY-DOH! What was I thinking? Kids and play doh don't always work out so well. 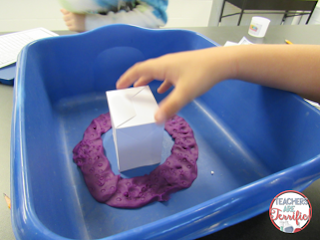 Do you know what happens to Play-Doh when it gets wet? 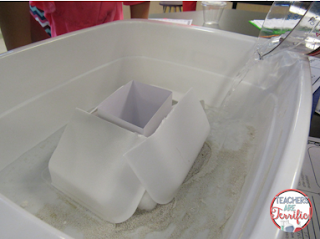 The kids built the flood barrier around their little houses, but for some reason, they thought if they really mashed it flat, like right into the bottom of that pan, it might work better. And it did, except for the cleaning up part. 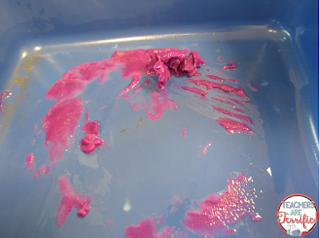 WET PLAY-DOH IS BAD! Very bad. It turns gooey and slimy and won't come off of anything. I scraped the bottom of pans like that one with plastic spoons to get it all out. 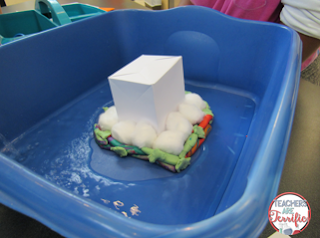 Okay, so move on to the third class making flood barriers. I decided to try clay. Yeah, we had piles of pans all over the place. 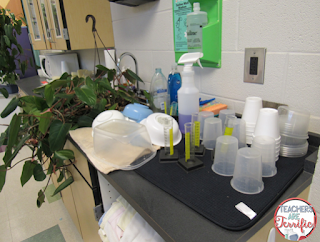 In the meantime, I still had a class that was in the experimenting stage of this challenge and that involves ten tons of little cups and graduated cylinders and various other little things that must be washed. Yes, that is the sink where we do dishes. The plant in the sink needed to be watered and it was raining outside. 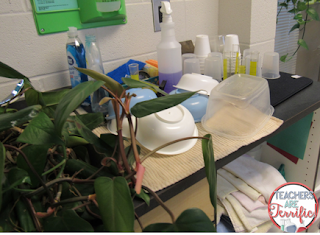 So, I resorted to filling both lab sinks with plants and switching them out until I got all the plants taken care of. Well, now that covers fourth grade. What was fifth grade doing? 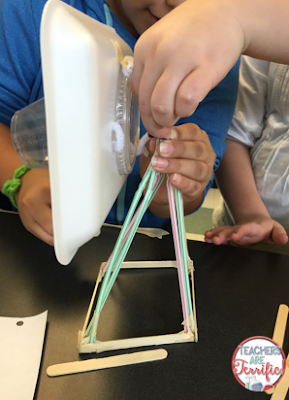 Building catapults and testing them! That would explain all the wood piled on the counter. 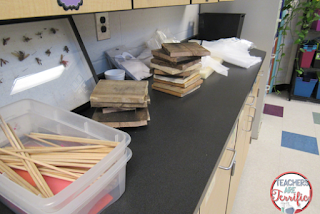 Way down at the end you can also see some of the absorbent materials we were testing in another class. 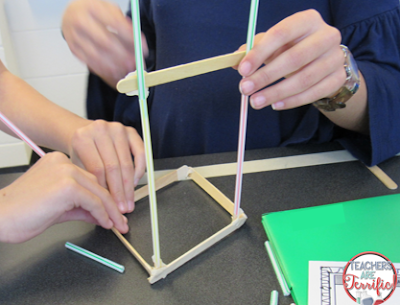 And the container of dowel sticks was for another class that was building towers. You know, it would certainly help matters if I could keep all the classes doing the same thing! But, inevitably one class gets ahead of the others so we constantly have something new going on! What was third grade doing in the middle of all this? At least index cards are easy to clean up! So, there you have it. I usually post only the good stuff. But now you know the truth. We work hard in the lab.